We are the Friends of Plymouth City Museum and Art Gallery, a registered charity established in 1951 to support the work of our local museum. Currently we are assisting the museum (The Box) to hold an internationally important exhibition about the Mayflower, focusing on the people involved, both the voyagers and native Americans whom they met. This will commemorate the 400th anniversary of the sailing of the Mayflower in 1620.  Objects and images will be coming from the USA, the Netherlands and the UK. Although there will be no charge from these museums, money is needed to restore the items, so they are robust enough for travel and for transportation often in bespoke boxes. This will be the biggest exhibition ever about the Mayflower and will attract visitors from both sides of the Atlantic. This should stimulate the local economy as well as put local people and visitors in touch with their heritage. The Second Peirce Patent is a legal document from 1621. 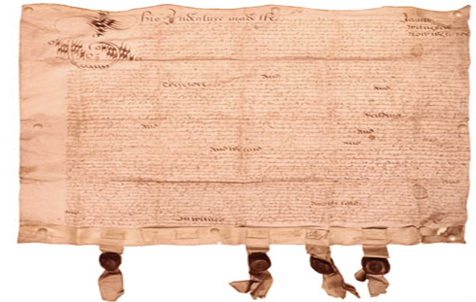 It’s also the document that gave the English passengers of the Mayflower permission to settle in (Native) America. It was signed by the first governor of our fort, Ferdinando Gorges, who reshaped the Plymouth Company of Virginia and the history of America. It’s important and, we think, it hasn’t been to England for 400 years. We’d like to bring it to Plymouth for 2020. But we and the document need your help. The Second Peirce Patent needs some care and conservation. The cost of that treatment is $5,200. This will repair tears and preserve its paper. It also needs a new frame and a bespoke box to travel here. That’s $2,925. The total work will cost $8,125 (£5,850). We need to fund this unique and important work. Possessions belonging to the passengers of the Mayflower are rare. This Bible is very special as it belonged to the ship’s cooper, John Alden. This object is the only passenger possession coming to Plymouth for 2020. 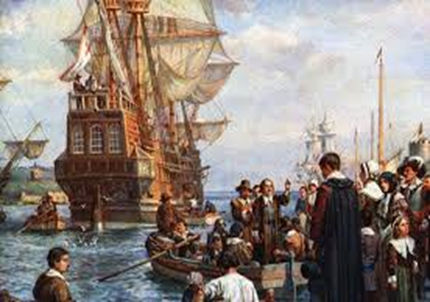 John Alden married another Mayflower passenger, Priscilla Mullins, and their descendants now live all over the world. The Bible was kept by the Alden family until it was given to Dartmouth College in New Hampshire in 1957. For many years, the Bible’s box indicated that it had travelled on the Mayflower in 1620. In fact, it was printed in 1633 in Holland, where the ‘pilgrims’ had lived before sailing to America. Precision packing and safe transport to Plymouth will cost £2500. This will enable one of the most symbolic possessions - to be seen, we think for the first time, in the UK. This is one of the first Bibles to be printed in America. It is written in an Algonquian language and recorded a Native American dialect for the first time. 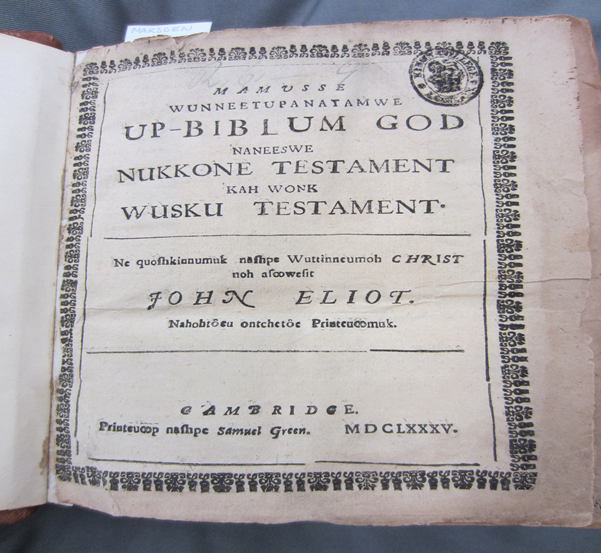 In the 17th century this Bible printed a spoken language. In the 21st century it helped the Wampanoag people to reclaim their language. While the missionary John Eliot created this written text of the Bible, Christian zeal suppressed spoken Wopanaak for over 200 years. Only now are the Wampanoag people – the descendants of those who met the Mayflower in 1620 - speaking their own language again. Uniquely, this Bible represents cooperation and conflict at the start of the English colonisation of Native America. The King’s College Bible needs conservation before it can travel to Plymouth for 2020. This will cost between £780-1130 + VAT. It will also need precision packing and safe transport at £500. This will enable the first Bible to be printed in America - written in the language of the Native Americans who met the Mayflower’s passengers – to be seen in Plymouth. In 1609, a ship called the Blessing sailed from Plymouth (UK) to Jamestown (America). It carried men, women and horses across the Atlantic. One of the women who travelled is now known as ‘Jane’. When she arrived in Jamestown, she discovered a colony starving. By the spring of 1610, 440 of 500 settlers were dead. Jane was one of them. Forensic archaeologists now believe she was cannibalised by other colonists. Her story is brutal, but true. Her reconstructed skull is evidence of the challenges faced by the first English settlers in America. After 400 years, we want to bring her home. The Smithsonian Institute in Washington and Jamestown Rediscovery in Virginia want to help us. They will enable Jane to return to Plymouth. This requires sensitivity and support. To secure her appropriate and safe transport across the Atlantic will cost £4500. 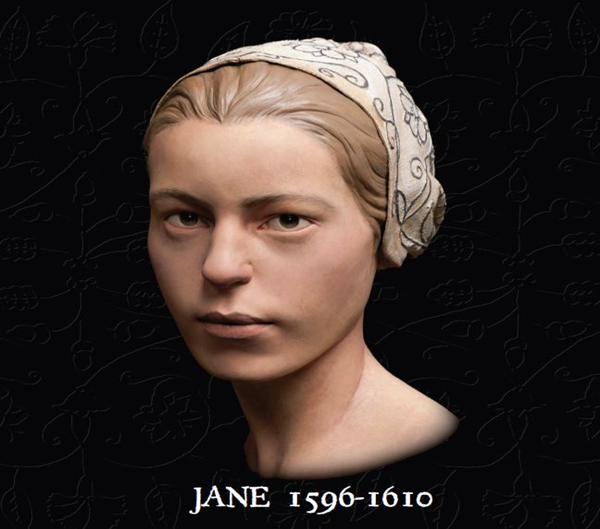 Jane left Plymouth in 1609. We awaits her return. Over the past 400 years, the Mayflower has been imagined and reimagined by writers and visual artists. Bernard Gribble is regarded as one of Britain’s most significant maritime painters. Specialising in historical narrative, the departure of the Mayflower was an ideal subject for this local artist. The painting shows the ship in Sutton Harbour with tenders taking the passengers across the water. One prays as he departs. The painting may have been commissioned for the 300th anniversary of the sailing in 1920, so is an important part of Mayflower commemorative history. Locally owned, this artwork and frame now needs restoration and specialised cleaning before it can be displayed. This will cost £2000. This painting is the most important depiction of Plymouth’s role in the Mayflower story. The Wampanoag people have lived in America’s eastern woodlands for over 12,000 years. Their society was sophisticated and successful. It survives today. 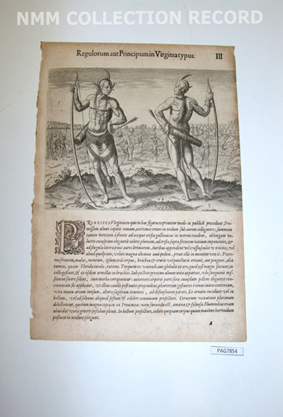 However, between 1616 and 1619, the Wampanoag population was decimated by epidemics of European diseases. Colonisation also brought conflict with English settlers and their successors. Today 5000 people live in Massachusetts as part of two federally recognised Wampanoag nations - Mashpee and Aquinnah. The Wampanoag Language Reclamation Project has enabled them to rediscover their ancestral language and artisans preserve their traditional skills and crafts. We are commissioning a new piece specifically for The Box. 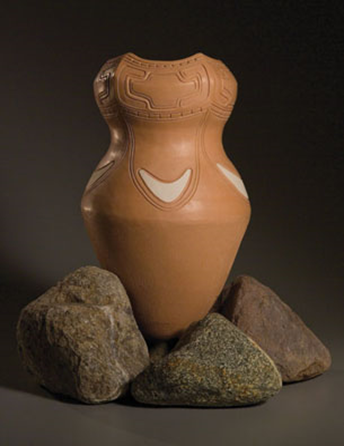 It will be the first Wampanoag artefact to be welcomed into the city’s collections. Created by Ramona Peters, it will be made using traditional tribal materials and techniques. The commission costs £2500. Transport will cost £1500. £4000 will make history. The Wampanoag people who met the passengers of the Mayflower enabled them to survive. John White gave England its first picture of America. His drawings recorded the people and places of Roanoke – the first English colony across the Atlantic. Drawn in 1585, the pictures became the call to colonise. 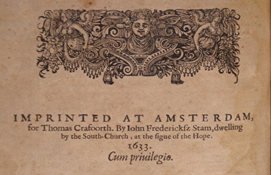 Appearing as engravings in Theodor de Bry’s publication of 1590, they were distributed widely and shaped England’s understanding of, and expectations for future lives in America. 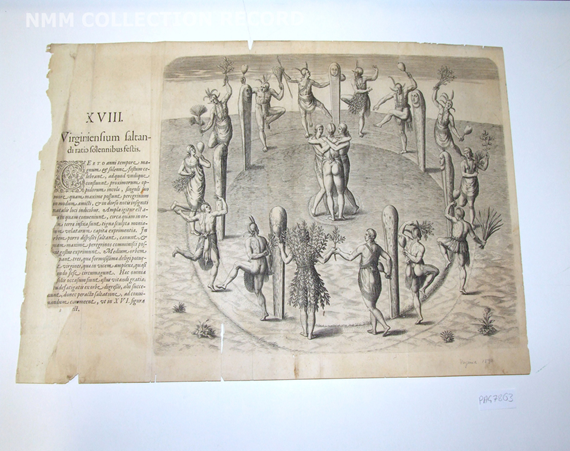 These prints are now nearly 430 years old, so need care and conservation. Each one costs £240 to repair and mount. We would like to show seven of John White’s pictures of America. That means £1680. John White’s drawings changed perceptions in 1590. They can do the same in 2020. In 1607/8, a community of influential Separatists left England. They sought religious freedom in Holland and found it in Leiden. It was in this Dutch city that the ‘pilgrims’ planned for America. Leiden welcomed the Separatists and enabled them to establish new lives. Many worked in the cloth industries or in printing. The city’s records detail the names and marriages of many who would sail on the Mayflower. Pieter Bast’s iconic map shows where they lived, worshipped and imagined new lives across the Atlantic. 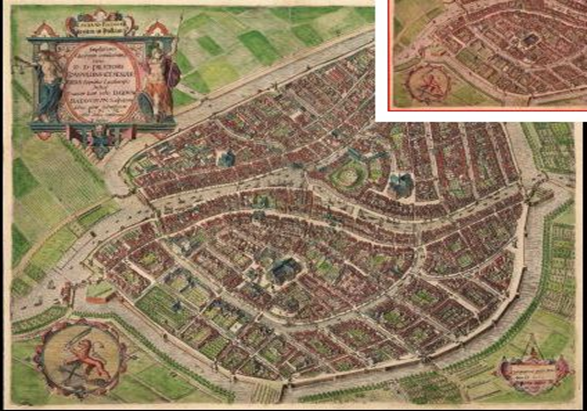 The Pieter Bast map of 1600 is part of the collections of Heritage Leiden. It is an integral part of ‘pilgrim’ history and we would like to bring it to England for the first time. With restoration, remounting and return flights, this will cost £750. Leiden changed the lives of the English Separatists who lived there. They would change the world. In 1952, the film Plymouth Adventure opened in cinemas on both sides of the Atlantic. Starring Spencer Tracey and Gene Tierney, it told the story of the Mayflower’s perilous journey across the Atlantic in 1620. The drama it recreated on board secured the Oscar for Best Special Effects. 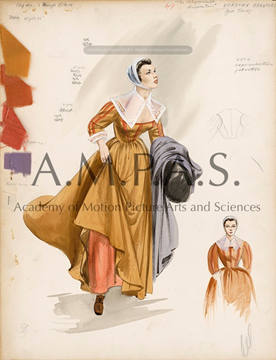 The film’s costume designer was Walter Plunkett – the creator of costumes for Gone with the Wind, Singing in the Rain and An American in Paris. 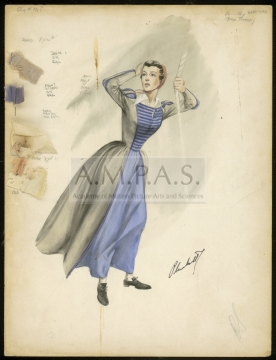 His designs are now part of the collections held by the Academy of Motion Pictures, Arts and Science in Los Angeles. We would like to bring them to England for the first time. The two hand-drawn designs are mounted on card, but are fragile. They require conservation packing, a courier and return flights. This will cost £1500. For over 400 years, people have shared the story of the ship. Writers, painters and film-makers have shaped its cultural legacy in print, on canvas and on screen. Plymouth Adventure is Hollywood’s homage to the Mayflower. There will be over 100 items in our bold new exhibition. these are just a few of them. It will explore early English attempts to colonise America, recognise conflict and coexistence with Native Americans, address the political and religious context for the sailing of the Mayflower in 1620, detail the lives of its passengers, and consider the cultural, demographic and personal legacies of the story. In helping us, you will be part of the Mayflower’s history. Please donate now. Any amount will help. All contributions are welcome. Individual membership of Friends of Plymouth City Museum and Art Gallery until 1st January 2020. Membership entitles you to free entry to Buckland Abbey, Smeaton's Tower and Mount Edgecumbe. We will send you a membership card and quarterly newsletters. Membership of FPCMAG for 2 people at the same address until 1st January 2020 including free entry to Buckland Abbey, Mount Edgecumbe and Smeaton's Tower. We will send your membership card and quarterly newsletters when we receive your address. Family membership (2 adults plus children) until 1st January 2020. Benefits include free entry to Buckland Abbey, Seaton's Tower and Mount Edgecumbe. Don't forget to send us your details so that we can send you your membership cards and newsletters. Life Membership for two people, including free entry to Buckland Abbey, Seaton's Tower and Mount Edgecumbe. We will send you a membership card and quarterly newsletters when we receive your address.